My kids each wrote a letter to Santa and gave them to the postal employees at the beginning of the Santa Claus Parade last month. Today, they got Santa's reply. 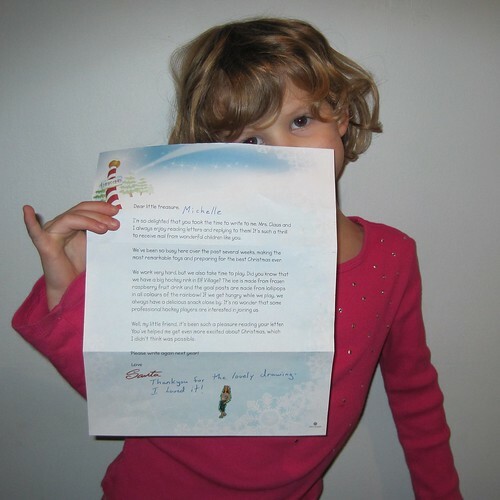 It blew little Michelle's mind that busy ol' Saint Nick took the time to write her back. Here she is showing off her letter. I tried to volunteer for this duty in the past but was told that it's reserved for retired Canada Post workers. Good for them...freakin' great program...love it. 1 of my sons has volunteered to write back for last couple years in Caledon. He enjoys it & some of the letters are very emotional which he gives to the person in charge. He has come home in tears at least once in last 2 years. I will never forget a letter he got to respond to 2 years ago from a young girl wishing her MOM would stay alive until Xmas (she had breast cancer & passed away just after). That was her wish from Santa - she was 8 years old. My son knew the person who wrote the letter & passed it to person in charge. I know this family & the Dad is doing a great job with his 2 girls now. My kids always lit up when the letters arrived. The posties were once good whipping boys given the disruptions in service etc., but they totally redeem themselves with this service. Merry Christmas to people who do this valuable service, the hearts you warm at this time of year are immeasurable. I remember as a kid getting one and my brother getting one. Awesome memory. Wow, I'm so glad to hear that this program is still going. I have vivid memories of getting these letters back from Santa. They must get some really emotional pleas from kids. Hats off to the responders for their part in helping to keep the magic alive. And I just love that it's on a real piece of paper!